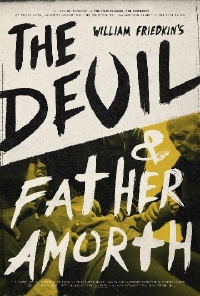 Years after he changed the landscape of American filmmaking with 1973’s The Exorcist, director, co-writer William Friedkin moves from fiction to fact with his new documentary, The devil and Father Amorth. What began as a brief conversation between Friedkin and Father Gabrielle Amorth – the head Exorcist for the Diocese of Rome for over 30 years – as two professionals who knew of each other’s work soon transformed into an once-in-a- lifetime opportunity, as Amorth agreed Friedkin could film an exorcism ceremony. It would be the ninth exorcism for a painfully afflicted woman, Cristina (a pseudonym), who had already been under Father Amorth’s care – and it would be filmed by Friedkin alone, with no other crew allowed, no light other than the natural light in the room and a small digital camera-and-mic unit that could capture the ritual and its revelations. Combining the startling and singular footage from Cristina’s exorcism with interviews from priests and psychologists, neurosurgeons and non-believers, Friedkin guides us on a journey into the twilight world between the boundaries of what we know and what we don’t with a singular and startling guide in the form of the urbane, charming and self-deprecatingly funny Father Amorth, a man who laughs in the face of the Devil both figuratively and literally. Combining Friedkin’s past memories and present observations with archival footage and new interviews – as well as also presenting what may be the only real exorcism ceremony captured on film – The Devil and father Amorth is a startling and surprising story of the religion, the ritual and the real-world victims involved in possession and exorcism.